Gustavo Poyet has praised the commitment of a Sunderland team half of which may not be at the club next season. Five of the 11 players not contracted to the Black Cats for next season were in the side which secured their first win at Old Trafford for 46 years. Norwich City’s 0-0 draw with Chelsea yesterday left Poyet’s team with work still to do to secure their Premier League status, but it seems highly unlikely they can be denied either on the pitch or in the courts. After the match, Poyet paid tribute to on-loan Santiago Vergini, Marcus Alonso and Fabio Borini, goalscorer Sebastian Larsson and Jack Colback, who are out of contract in the summer. “As we stand today, Santiago Vergini doesn’t have a contract, Marcos Alonso is going back to Fiorentina, Seb Larsson and Jack Colback don’t have contracts, Fabio Borini is going back to Liverpool,” Poyet explained. “But the players, they don’t want to go down. They want to fight for their lives and we defended an incredible manner. “Even conceding the two goals against Manchester City we were really strong that day, and in all the last four games especially. “There has been a commitment from the players to do something special. The injured Ki Sung-Yueng is on loan, while Phil Bardsley, Keiren Westwood, Andrea Dossena, Oscar Ustari and Craig Gardner are also out of contract. Sunderland have picked up 10 points from their last four matches, even though three have been at Chelsea, Manchester City and Manchester United. They have two home games this week against teams in the bottom half to add to that. “It’s nice that teams don’t want to play us,” commented Poyet. “I wish we could keep playing for a couple of months and keep moving up the table. “After January I thought that would be the case but after the (League Cup) final we were on a run that was scary. 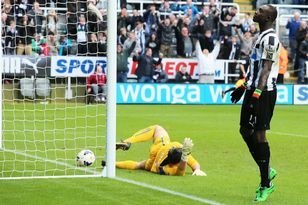 Larsson’s goal was created by Connor Wickham, April’s Premier League player of the month after five goals in four games – prompting talk of a call-up to England’s World Cup squad. “From the players available you will need someone with pace, you will need someone who can hold up the ball, someone in the box, someone who drops off,” said Poyet. “He (Roy Hodgson)’s going to have to pick one or two big players – is it (Andy) Carroll, is it (Rickie) Lambert, is it Connor? That’s up to the manager really. Their seems little prospect of the Premier League increasing Sunderland’s punishment for fielding an ineligible player despite talk of a legal challenge. Ji Dong-won played four times for the Black Cats when he did not appear on a Fifa list of players for drug-testing purposes. The Korean was properly registered, and had international clearance when he joined in 2011 but on his return from a loan at Augsburg last season it was discovered an online form had not been filled in properly. The Wearsiders insists this was a technical fault rather than any oversight. That Ji’s registration was otherwise correct, and that Sunderland had brought it to the Premier League’s attention, meant they were only fined.